January and February have brought icy cold weather, wind chills and snow to many parts of the world. Reading about the recent polar vortex causing shockingly low temperatures in Chicago, reminded to our trip to Lapland last year. We were chasing the Aurora and with that thought in mind wanted to book a slightly remote getaway. I found the cottages at 7 Fells Resort at Akaslompolo very attractive and was very excited about our trip. A lot of firsts were to happen on this trip to Finland! We thought it would be a good way to acclimatise to the weather and so we stayed one night in Helsinki at a lovely Air BnB before heading to Lapland. Landing at Kittila airport was magical. It was truly a pristine white winter wonderland. The airport itself is tiny but brilliantly managed. There is a public transport bus from just outside the airport which goes to most of the popular ski resorts and also towards 7 fells. Our rest was a short walk uphill (50m) after the last stop on the bus. Now here’s the tricky bit for people like me. It was snowing heavily, the road had no vehicular traffic passing, it was absolutely quiet and all the road signs were covered in snow. All I knew was that we had a short walk uphill and the resort was on the right. To add to this scene out of a suspense film, because we had taken a late afternoon flight into Lapland, by the time we got off the bus it was almost dark. Obviously, there was no one around to ask for directions! We ended up walking past the resort, uphill, dragging our suitcases. My lungs were exploding, the snow was coming down so heavily now, it was getting difficult to see properly and the heavy jacket that I was wearing was weighing me down a lot. As soon we entered the heated reception area, everything seemed perfect again 🙂 As the relief washed over us, the realisation that we had finally made it to our destination began to sink in. 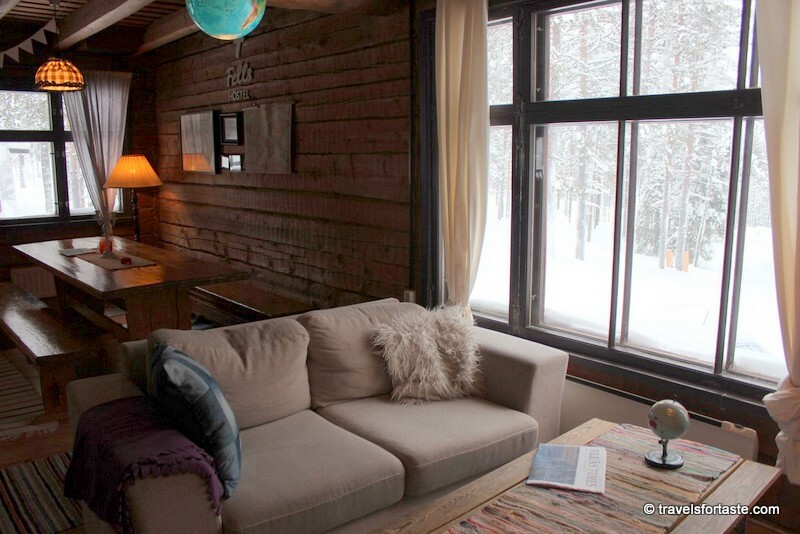 A short wait and a very friendly staff member checked us in and showed us to our studio cabin. It was love at first sight for us. 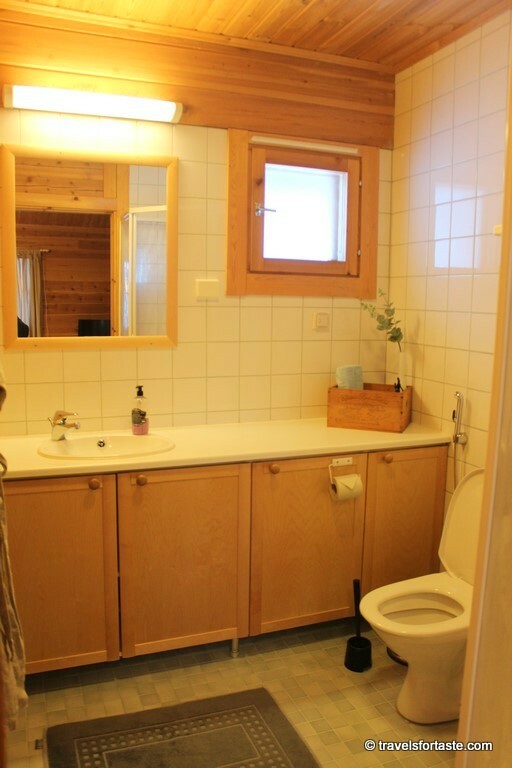 This beautiful log cabin has everything one could ask for. A super comfy bed, a spotlessly clean shower, a very cute kitchenette, a mini refrigerator, table and chairs, a jar of oats, tea and coffee. 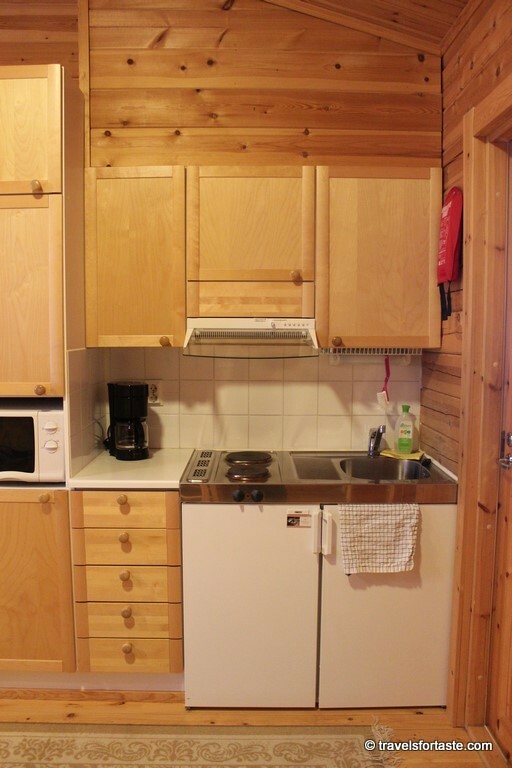 The kitchen is very well equipped with everything one could possibly need to cook a meal, cutlery, glasses, dishes, a kettle and coffee maker, also packets of spices and soup cubes left behind by previous occupants. 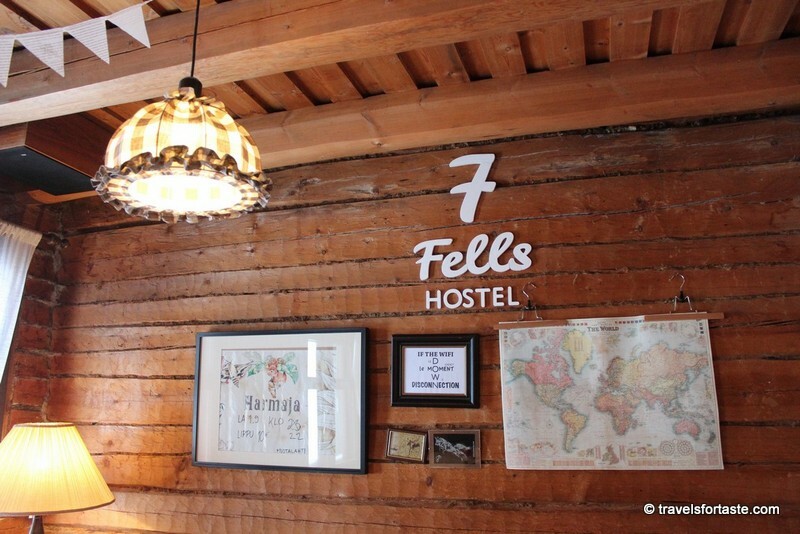 One of the main reasons we picked 7 Fells Hostel was because of its location. 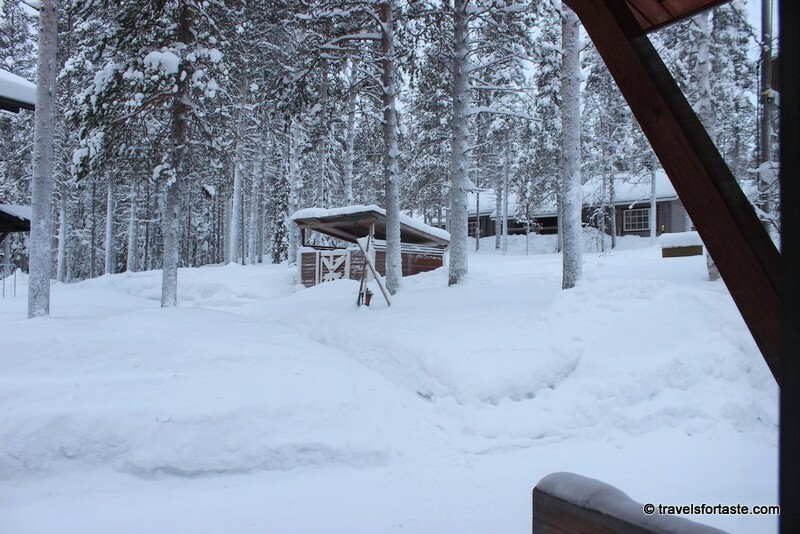 Located in the beautiful village of Äkäslompolo in Kolari, Lapland, it is conveniently situated for skiers and adventure sports seekers alike. 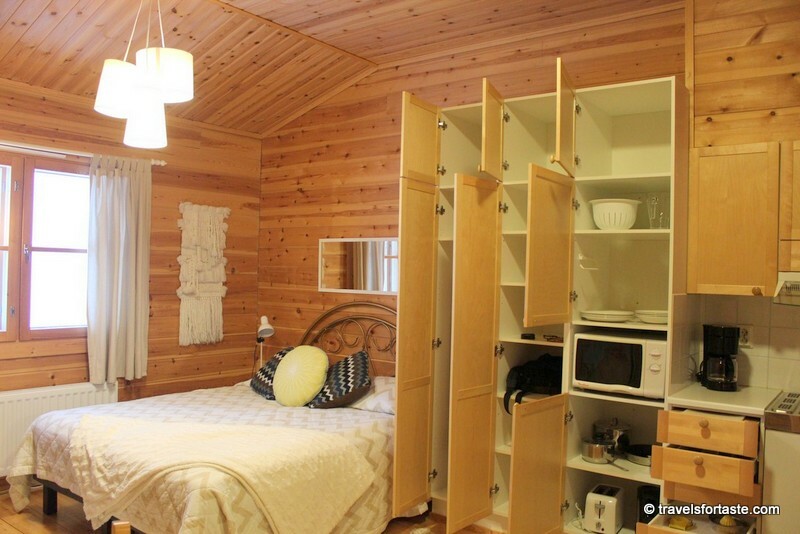 Also, we really wanted to experience what it would be like to live in a little cabin in the woods. 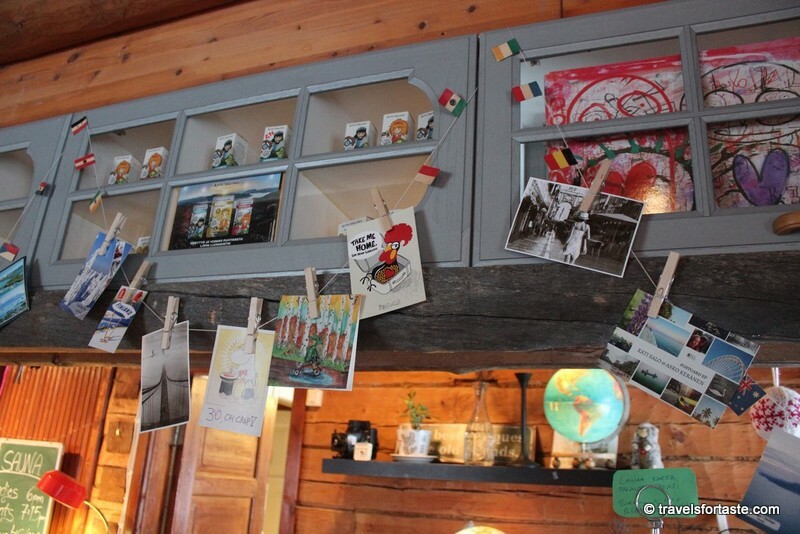 This gorgeous eco hostel is run by an enthusiastic backpacker Tinja and offers a selection of accomodation options to suit every need. 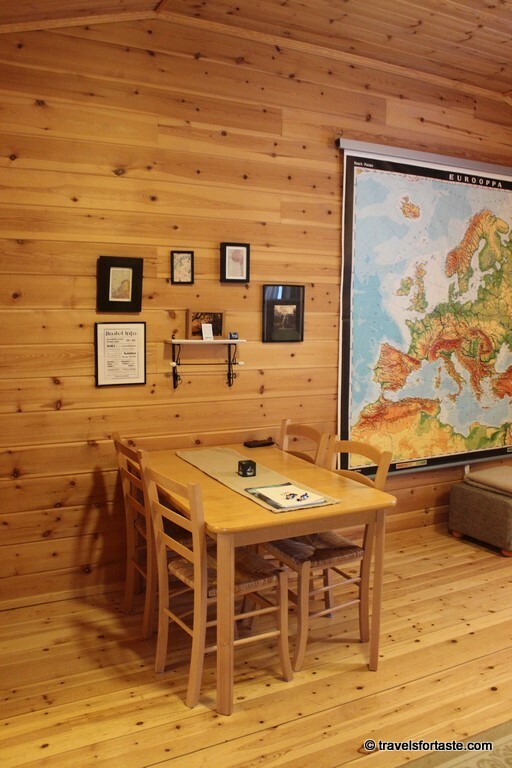 One can book into single or twin rooms or dorms with shared facilities in the main hostel area. 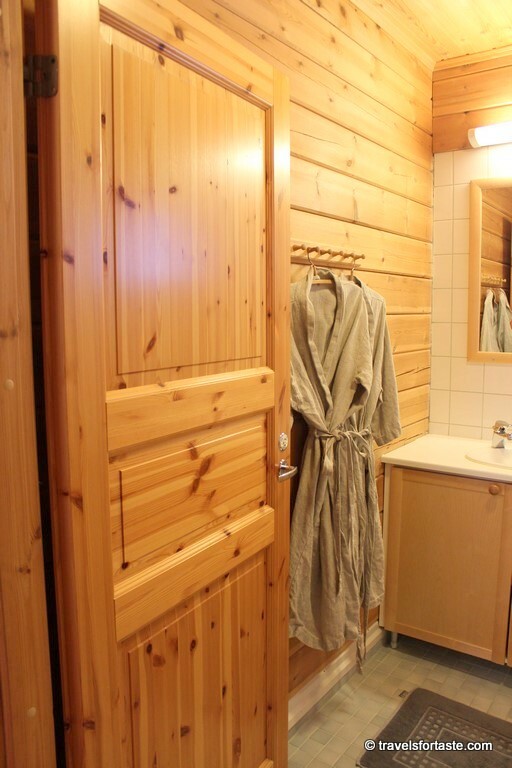 Apart from these rooms which are located in the main building, there are cosy log cabins called studio apartments which come fully equipped with their own shower and kitchenette and there is also a luxury chalet with its own sauna and fully fitted kitchen. But the most amazing part about this hostel is that it is eco-friendly. 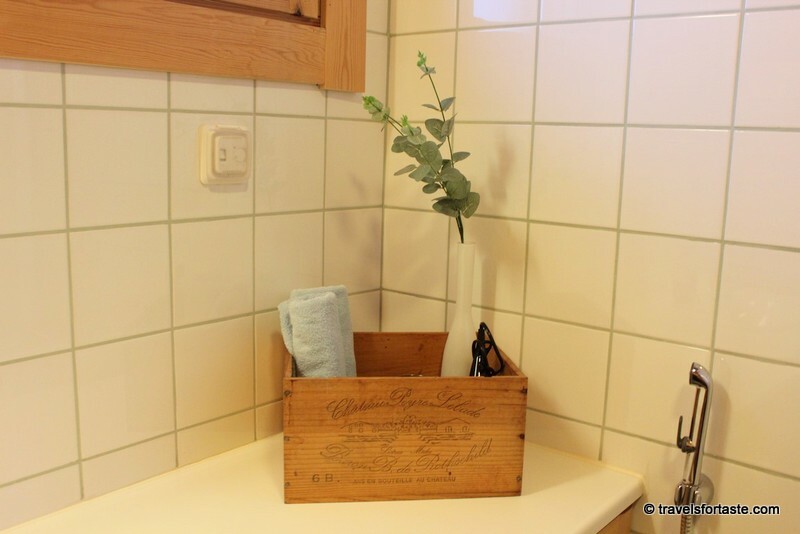 They use green energy, provide organic tea and coffee, use eco products for washing up and the rooms are all painted using plastic free odourless paint. 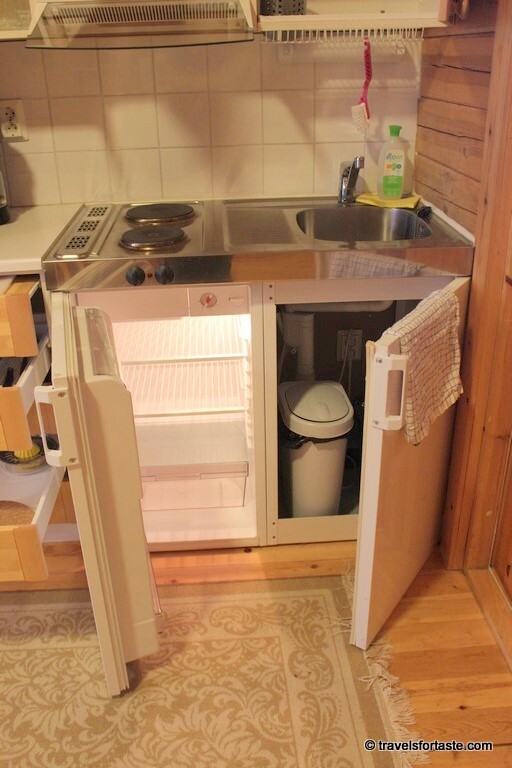 After we settled into our room, we walked down to the village supermarket – Jounin Kauppa Supermarket. It is located 1.8 km away from the hostel. After browsing through the huge and very well stocked supermarket which has a pharmacy and a cafe inside too. Cooking dinner in our little cabin was great fun and very quick and easy. 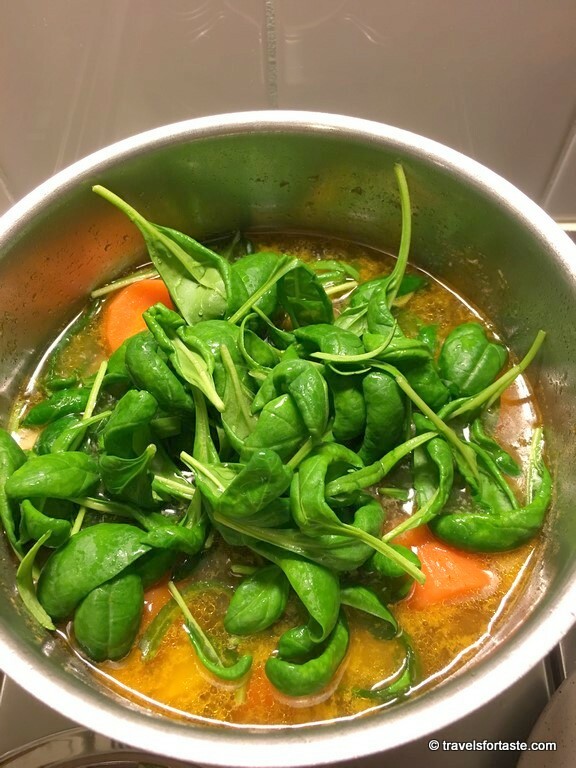 We enjoyed a spicy chicken and vegetable soup which I made using all the fresh ingredients I’d just purchased from the supermarket. We had a long day of exploring our surroundings planned starting early the next morning, so we decided to turn in early on our first night in. A bowl of my chicken soup and a hot shower later, I think I fell asleep before my head hit the pillow. 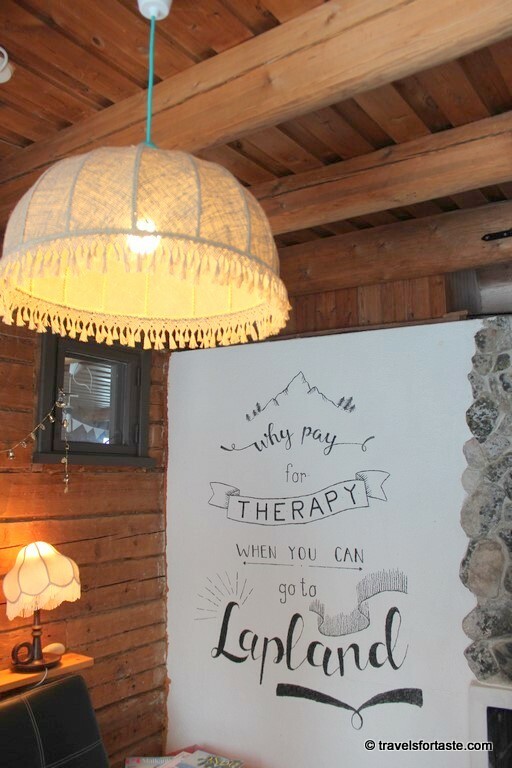 I love the whole concept behind this hostel. To be able to provide such a beautiful experience on a budget in a remote location, keep it eco-friendly, warm and welcoming and ensure that all rooms and common areas are so well equipped and clean is a brilliant achievement. The opportunity to meet and interact with friendly people is an added bonus. 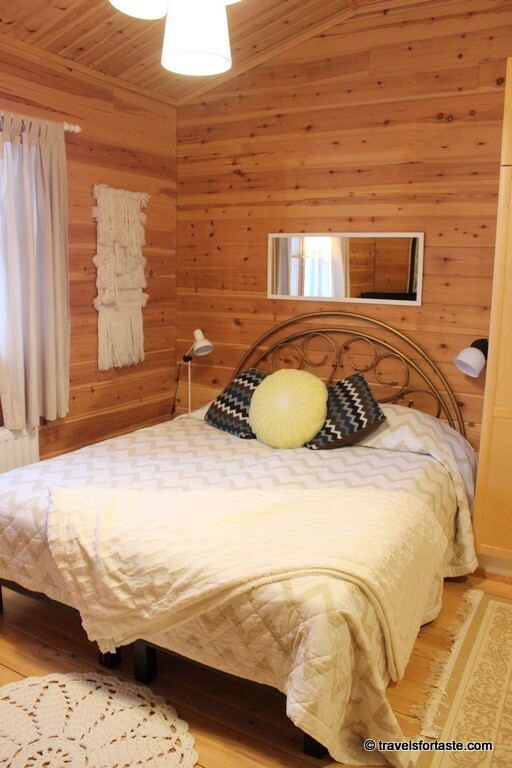 Walking distance from Bus stop from Kolari Train Station and Kittilä Airport bus, Frozen lake a short walk away, Ski tracks and Ski Resort Ylläs close by, Restaurant, Pubs and a well stocked Supermarket a stone’s throw away. I could go on but honestly, you can’t put a price to an experience like this. I am positive that I will return to this beautiful gem of a place, to be one amongst nature once again. And hopefully, be rewarded with stunning views of the Northern Lights. * I planned this entire trip on my own and have paid in full everywhere I have stayed at and eaten at, also for all activities. As always all opinions expressed are as always my own.